Though it’s currently lying in the online shadows of Mario Kart 8 Deluxe and Splatoon 2, ARMS is one of Nintendo’s latest new IP’s, and a multiplayer heavy-hitter of the Nintendo Switch. The acrobatic Fighter has players going head-to-head in the ARMS League and Grand Prix, where fighters are either made or broken in a series of intense long-range boxing matches complete with weapons and character-specific abilities. Following the recent release of DLC character Max Brass, Nintendo is hinting at another new combatant of the ARMS Grand Prix with a brief video teaser on Twitter. 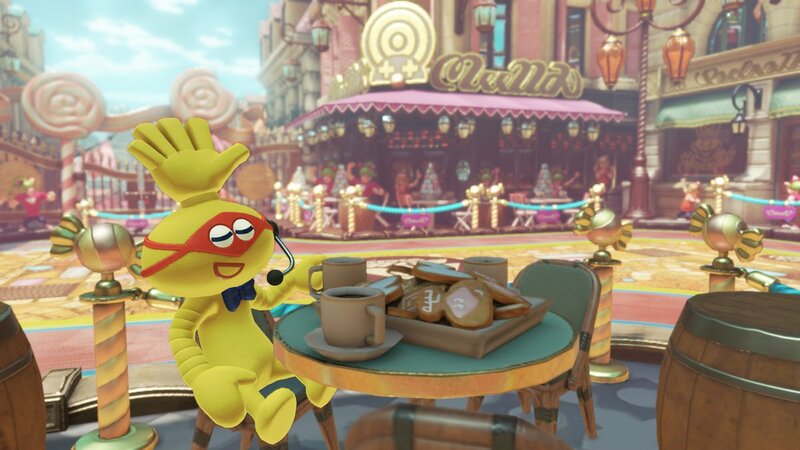 The post on the official Japanese ARMS Twitter account reads that announcer Biff caught wind of another ARMS fighter while traveling overseas; the fighter in question can apparently change his or her body shape at will, however Biff could only back up his claim with unclear footage from a broken camera.